The subject of consciousness has an enduring appeal. Regardless of the advances made in psychology on a variety of fronts, we seem to be forever hamstrung by the apparently unfathomable problem of just how conscious experience came to exist in a causally closed physical universe. The response of Feinberg and Mallatt is to put forward an account of their theory of neurobiological naturalism in an effort to explain the ‘subjective–objective barrier’. In doing so, they perform some manoeuvres that will be recognisable to those familiar with the literature on consciousness. For example, human conscious experience is portrayed as having features in common with ‘primary consciousness’ or rudimentary sensation and affect. We are then presented with the claim that simple vertebrates (such as lampreys) possess primary consciousness. Whilst this claim may have merit (and some would argue that it does not), the shifting of the dividing line between conscious and non-conscious parts of the universe does not in itself close the explanatory gap. We are still left with the question of how the ‘something’ of subjective experience arises from the ‘nothing’ of an objective physical universe. While appearing to lower the bar for what can be accepted as conscious experience, the authors insist that ‘life’ is one of the defining features of consciousness, which would seem to exclude the possibility of conscious machines. Perhaps the argument for this is sound, but the brevity of the discussion is such that limited attention is given to this and other key points. The book is certainly concise. The authors complete their demystification of consciousness in 122 pages and in the remaining 77 pages of the book is a glossary which includes some items that may raise eyebrows: a reader who feels compelled to turn to the glossary for edification following an encounter with terms such as ‘attention’, ‘central nervous system’ and ‘synapse’ is surely ill-equipped to tackle the literature on consciousness. Who, then, is the book aimed at? 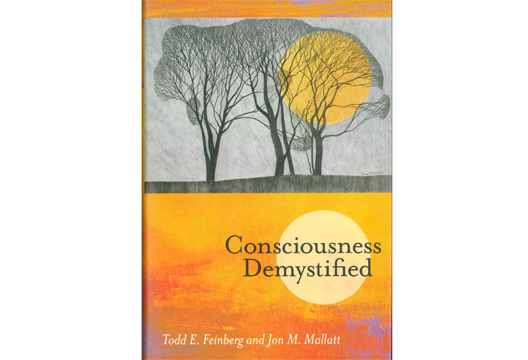 Serious scholars are likely to find their appetite whetted in an almost cruel fashion, and yet readers with a casual interest in consciousness may find the material just too narrowly focused. The book is a worthwhile read but the authors’ ideas deserve much more comprehensive discussion. It is difficult to shake off the feeling that those seeking such a discussion will need to locate a copy of the authors’ more substantial book, The Ancient Origins of Consciousness.